Mark 1:17 - "Come, follow me," Jesus said, "and I will make you fishers of men." When I was in high school, our family used to fish every year during spring break. One year my brother and my mom couldn't go, so my dad let me invite a friend. We arrived late at night, unfolded the camper, and went to bed - dreaming of tomorrow's day in the sun. But during the night, an unseasonably strong norther blew in. It got cold fast! The wind was so strong that we could barely open the camper door the next morning. The sky was gray. The lake was a mountain range of white-topped waves. There was no way we could fish in that weather. The next morning it wasn't the wind that made the door hard to open, it was the ice! When we awoke the next morning to the sound of sleet slapping the canvas, we didn't even pretend to be cheerful. We were flat-out grumpy. The next day was even colder. "We're going home" were my father's first words. No one objected. I learned a hard lesson that week. Not about fishing, but about people. When those who are called to fish don't fish, they fight. When energy intended to be used outside is used inside, the result is explosive. Instead of casting nets, we cast stones. Instead of extending helping hands, we point accusing fingers. Instead of being fishers of the lost, we become critics of the saved. Rather than helping the hurting, we hurt the helpers. Leave soldiers inside the barracks with no time on the front line and see what happens to their attitude. The soldiers will invent things to complain about. Bunks will be too hard. Food will be too cold. Leadership will be too tough. The company will be too stale. Yet place those same soldiers in the trench and let them duck a few bullets, and what was a boring barracks will seem like a haven. The beds will feel great. The food will be almost ideal. The leadership will be courageous. The company will be exciting. 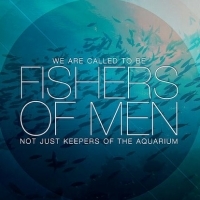 When those who are called to fish, fish -- they flourish! Make a note of that. The next time the challenges "outside" tempt you to shut the door and stay inside, stay long enough to get warm. Then get out. When those who are called to fish don't fish, they fight.